The Government is seeking views on consumer redress and ADR by 4 July. 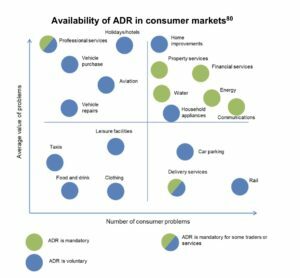 Consumers should be able to avoid ‘costly court hearings’ through better access to high quality alternative dispute resolution (ADR) services, a government consultation on moderinising consumer markets has recommended. 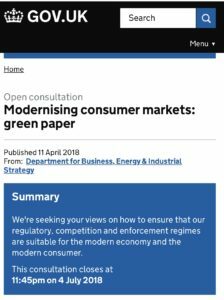 In a consultation paper the Department for Business, Energy and Industrial Strategy says it wants people to feel confident about pursuing complaints under a ‘strong set of consumer rights’. The paper recommends three principles for an effective modern consumer market: competition to drive innovation, new technology that works in favour of the customer, and redress for when things go wrong. The research suggests that the system of alternative dispute resolution could be more effective. First, in non-regulated markets where participation is voluntary for businesses, take-up has been low. The Consumer Ombudsman, which offers its service in sectors where participation in alternative dispute resolution is voluntary, received 5,600 complaints in 2017, but businesses agreed to participate in only 6% of cases. 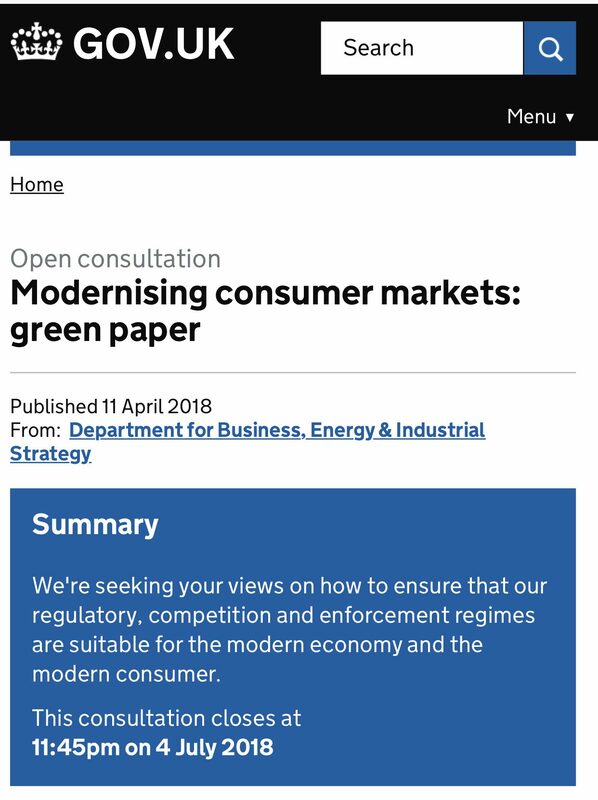 The government plans to explore the potential for extending this model of industry-wide agreement where existing complaints processes are not meeting consumers’ needs. They are also currently consulting on strengthening redress across the housing market and will make it mandatory for private landlords to be part of a redress scheme, giving all tenants access to quick and easy dispute resolution over issues like repairs and maintenance. The Government does not believe it would be proportionate to make alternative dispute resolution mandatory in every sector due to the costs imposed upon business. However, it believes mandatory alternative dispute resolution should be considered for sectors in which there are high levels of high value complaints, such as second-handcars and home improvements. This could incentivise quality of service and prevent consumers having to abandon legitimate complaints. Accompanying the consultation, a study assessing the effectiveness of ADR claimed that 62% of consumers who had been through ADR found the process simple, compared with 53% of those who went through the courts. In cases where the ADR provider decided in favour of the consumer, 83% of consumers perceived the process to be fair. This dropped to 17% in cases where the decision was against the consumer or ended in compromise. A similar, but less extreme, variation was seen for consumers who had opted for the courts (90% v 53%). For disputes that consumers took to court, this study sought to establish why ADR wasn’t used or, if it was, why it wasn’t successful. The survey found that 33% of consumers and 54% of traders who used the courts reported that they had used ADR before going to court. 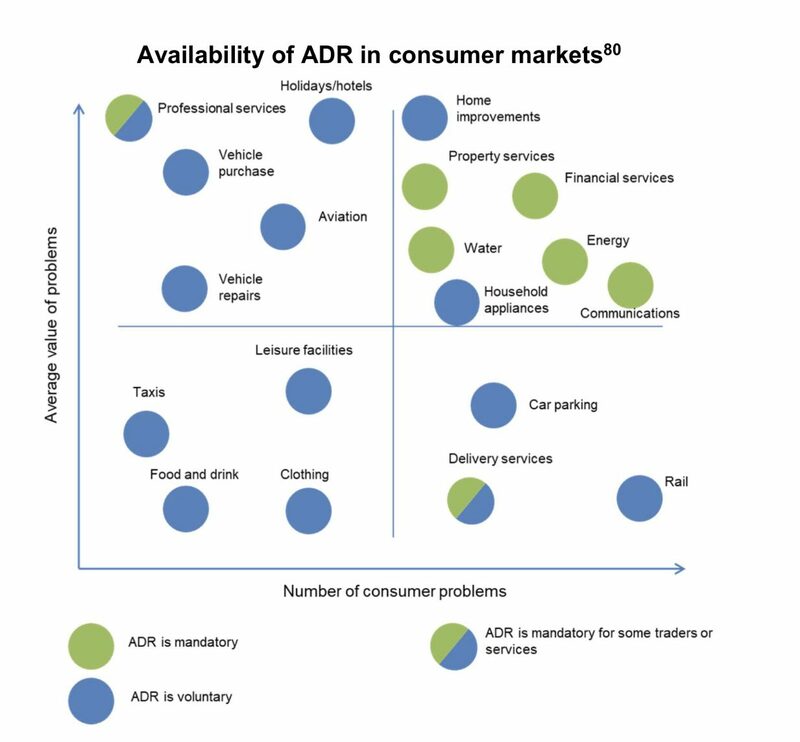 The reasons cited as to why ADR did not solve the problem vary between traders and consumers. For traders, the main reasons relate to the lack of agreement or decision made or the customer’s refusal to accept the offer (each reason was cited by 32% of traders). For consumers, the most common reason cited was that the trader did not comply with the agreement (cited by 52% of consumers). The most common reasons given by consumers for not using ADR were that the trader refused to participate (70% of consumers who didn’t use ADR beforehand), followed by a lack of confidence that ADR would be effective (13%), a lack of response from the ADR provider (7%), and being unaware that ADR was available (5%). They interviewed 200 consumers who had used ADR services as well as 200 consumers and 176 traders who had used the court system. The government also sought to interview solicitors. However, of 15 contacted, only three agreed to an interview, the study states. The government said the aim of the interviews was to understand the types of cases often brought to courts whether traders comply with court rulings and suggestions for how the system can be improved. In our view, ADR should be made compulsory in consumer cases. After all, if traders use mediation they are not bound by an outcome against their will. However the government does not recommend this, even though there is evidence that businesses only agreed to use ADR in a shocking 6% of cases. We will be responding to the consultation suggesting this. It is disappointing but not surprising that the majority of solicitors contacted for their views refused to assist.